Description: Truly A One of a Kind! 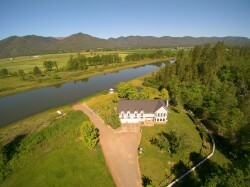 This very private 52 acre property includes a 10 acre Waterski/ Wakeboard/ Fish Reservoir with boat cove, dock, & boat ramp. Not to mention a beautiful 3666 sqft 4 bed/ 3.5 bath custom built home overlooking the reservoir all surrounded by 40 acres of seeded pasture. Vinyl fencing with paved drive and gated entry. Amazing views that include the Table Rocks surrounding mountains, and the reservoir! The main level offers a large open kitchen, formal dining and living room, breakfast nook with French doors to patio, possible in-law setup, and a 3 car garage. Upstairs you find several oversized guest rooms, the master suite with private balcony, large bathroom with jetted tub and oversized tile shower, walk-in closet, & double vanity. Large family/ game room with large deck overlooking the reservoir, swim cove, seasonal creek and beautifully landscaped grounds. Other features include alarm, covered patio with swim spa, small greenhouse, gazebo & so much more!